Hello friends! 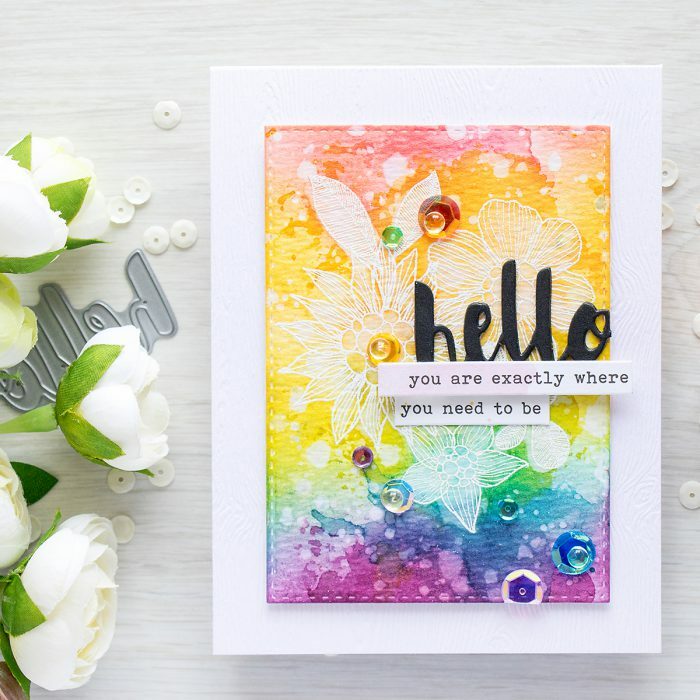 Have you see then new Rainbow Card Challenge started by the incredibly talented Dawn from WPlus9? I was tagged by amazing Debby Hughes and I’m thrilled to join in on all the fun. 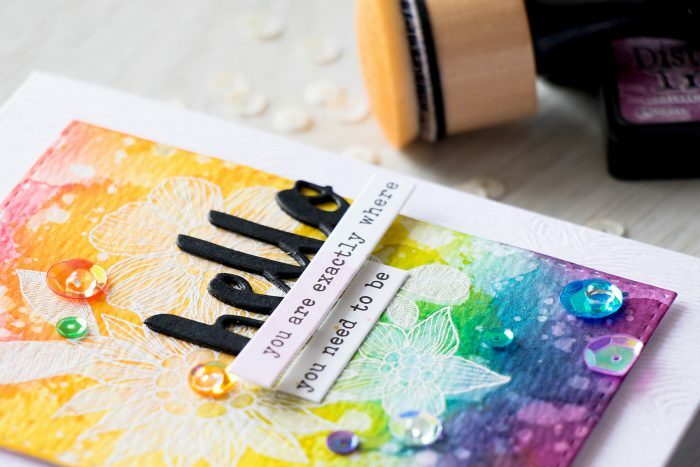 The idea is simple – create a card and include rainbow colors and tag two friends to play along. 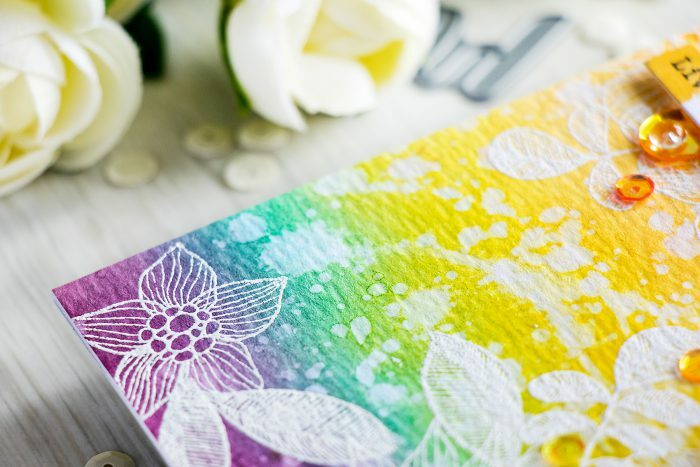 Rainbows or rainbow color combos is something I probably never use on my cards, I love how Laura Bassen always so effortlessly incorporates rainbow colors into her cards, but me – nope, never done that. So it was time to try and conquer those 7 colors on a project (I did do one card recently where I used rainbow colors, but it was probably the first and only one for me up until now). I’ll start by saying that I was inspired by a few things, first the Summer of Creative Chemistry at onlinecardclasses.com (nothing beats the magic of Distress inks and this is what I am using today). If you are not taking those Creative Chemistry classes – you should, they are top notch! Second, I am always fascinated by Yoonsun Hur projects and her use of white heat embossing and watercolor. 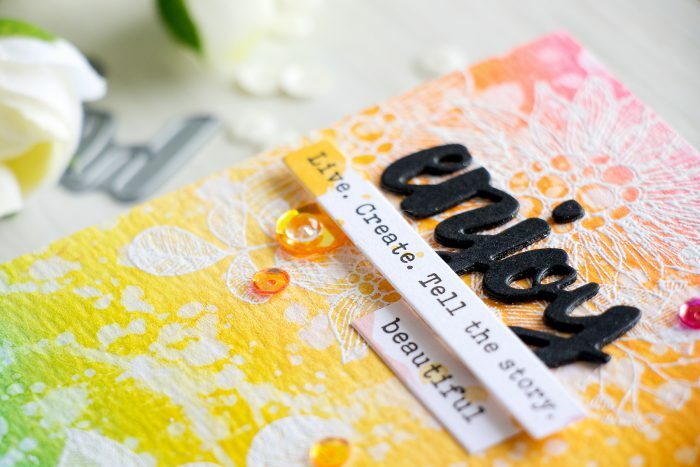 It was probably THIS card that inspired me most – I love the look of overlapping heat embossing without masking. 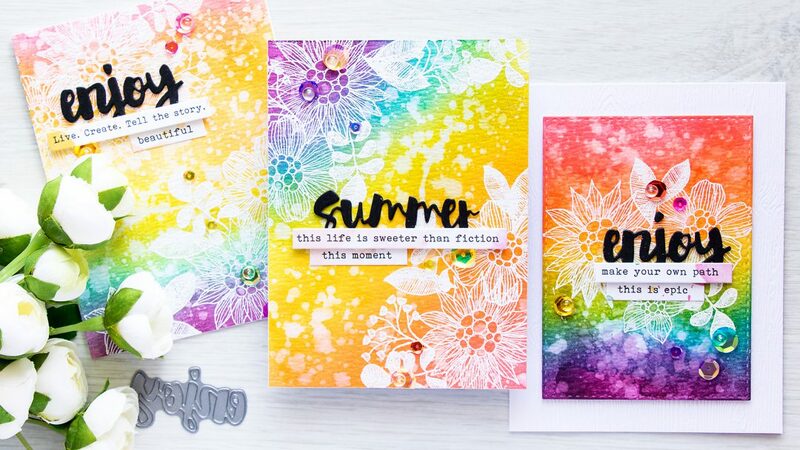 I used two ways to add Distress inks to my cards background – ink blending and ink smooshing. Both fun and easy to do, the second one probably being easier in a sense that no special tools are needed for that. I used several colors of Distress inks, I picked out my most favorites: Seedless Preserves, Peacock Feathers, Crushed Olive, Mustard Seed, Wild Honey, Ripe Persimmon and Worn Lipstick. To heat emboss flowers and leaves I used images from the Flower Garden stamp set from Simon, its an older set, also one of my favorites (probably one of my first sets too). 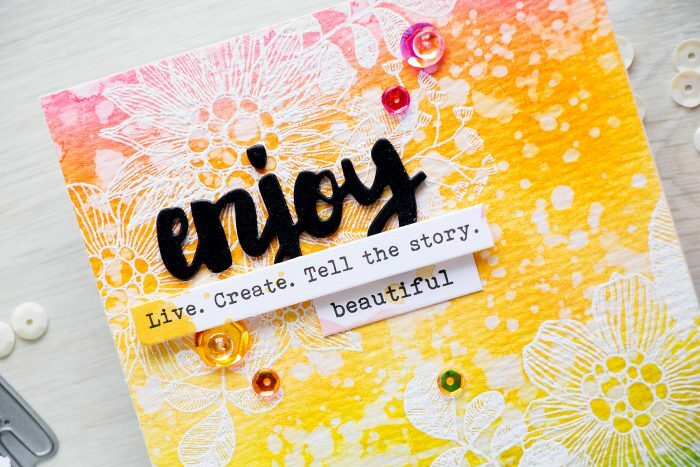 To create sentiments I used dies and die cut Hugs, Enjoy and Summer out of black cardstock. I also used Scrapbook Adhesives foam adhesive sheets to add dimension to my die cuts and to adhere them onto the cards. Aside from word dies, I added sentiment stickers onto each card, I foam mounted the longer sticker and adhered the shorter one directly onto the background (the stickers seem to be discontinued now). 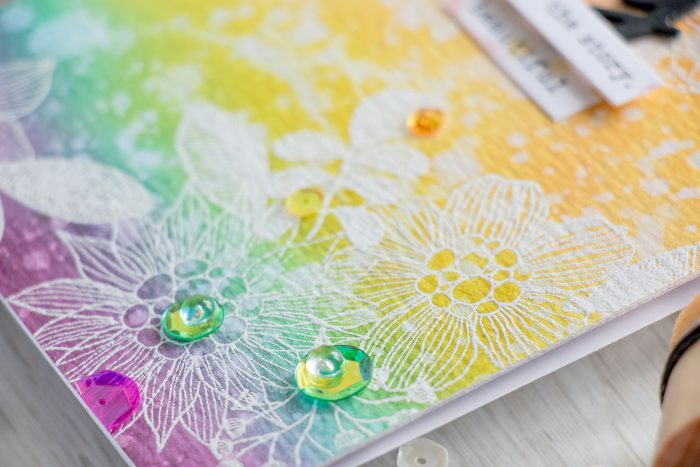 I also used Simon’s translucent sequins, I love how Debby used those on her cards, these are perfect addition to a rainbow background. I’d like to tag May Park and Amy Lee – I think these ladies will rock the rainbow! Anyone can join this challenge, don’t be shy! I’m always inspired by these ladies as well. Their work with color is outstanding. Your background is a breathtaking, it’s so happy and juicy. Distresses in all their glory. Black sentiment and sequins in tone are great addition to this background! Such beautiful cards Yana ! I also love the way Distress ink react, we can do so much things with them ! Thanks for sharing ! Your cards are so gorgeous! I really enjoyed your video too, I love the way you explain how you create your cards…you are very inspiring! I love these cards Yana! I have so many ideas – thanks for sharing! Wonderful! The colors are fabulous!